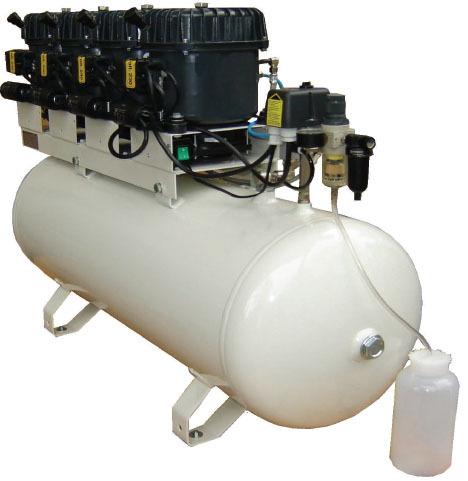 Dimensions: 44.1" x 13.4" x 32"
Are you looking for a really big powerful air compressor for quick and smooth application of a medium on a large-scale project? Then the Silentaire Val-Air 200-100 AL Compressor is what you need. Featuring a big tank of 26 Gallons and 4 powerful motors it is capable of delivering a large volume of a medium under high air pressure. And as one of the air compressors from Silentaire Technology, it works so silently you won't tell its running sound from the noise of your refrigerator. The company's products have already earned the trust of many customers around the world and continue their expansion while leading the market in low noise level, efficiency, and reliability. More specifically, the first thing about Silentaire Val-Air compressors is, of course, their ultra-quiet operation. However, this is not the only one benefit of this product line. This is also a pass to the fun and enjoyable airbrushing without worrying that the compressor can get overheated. Because of a special pressure switch, a Val-Air compressor doesn't need your constant control over the air pressure in the tank. Once the pressure goes up to its maximum limit, the switch stops the motor preventing compressor overheating. As soon as the pressure level drops to the minimum, the switch will start the motor again. What's more, all Val-Air compressors come with "AL" pumps. Which means that they have improved aluminum heads with cooling fins for even more effective cooldown. a handle or wheels to make carrying and transport easier. On top of that, the compressor comes with an oil bottle type ROLOIL - SINCOM/32E, instruction manual, and a tank certificate. The Silentaire Val-Air 200-100 AL Compressor has a standard 1-year warranty from the manufacturer. The guarantee becomes valid from the date of purchase. Under warranty, the manufacturer will freely repair and replace defective parts of the compressor if recognizes them as such. However, note that the electric parts and worn parts are not covered by this guarantee. 44.1" x 32" x 13.4"
58" x 45" x 31"